A Map of the Towns of Livingston Germantown and Clermont in the County of Columbia. 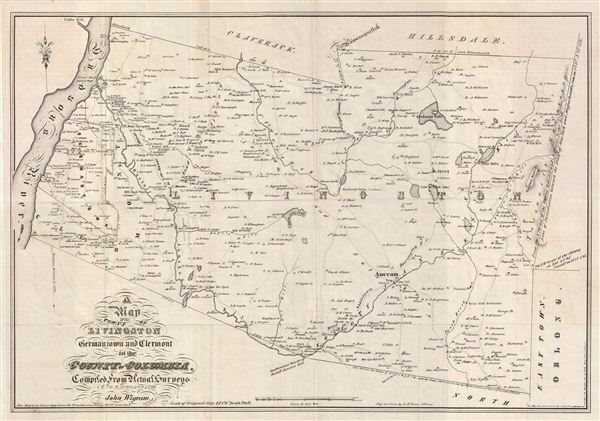 This is a fine example of David Vaughan's 1850 reissue of John Wigram 1798 map of the towns of Livingston, Germantown and Clermont in Columbia County, New York. The map covers the Hudson River to the boundary of Massachusetts. Multiple homesteads, family names, farms, mills, roads, churches, rivers, lakes and various other topographical details are noted. The Livingston Manor, now long gone, is also identified. This survey map marks numerous houses and notes the names of its owners. engraved by R. H. Pease of Albany. Very good. Original fold lines visible. Typical wear over folds. Minor discoloration near edges. Professionally flattened and backed with archival tissue.